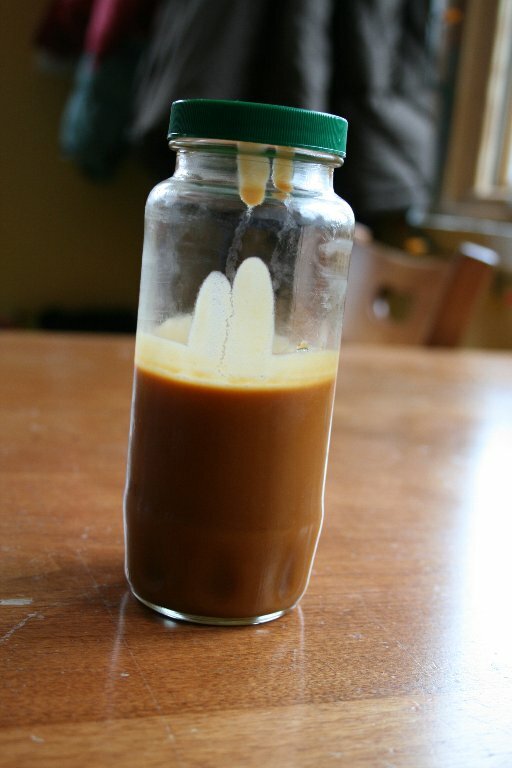 I made this caramel last week or so, planning to give away jars of it for the holidays, but nearly all of the jars are still sitting in my fridge, because I am TRAPPED by the snow! It’s okay, though, cuz it keeps for some 3 months in the fridge. The recipe for the caramel sauce is from the Winter 2004 issue of Fine Cooking magazine. Yeah, it’s only taken me 4 years to finally try the recipe. It makes quite a lot, so it’s ideal for giveaways. I thought it’d be fun to pair it with a little container of finishing salt (the salt in the photo is from The Meadow). The recipe does NOT require a candy thermometer, so those of you who are generally scared of making candy need not fear. I caution you, however, to watch the sauce carefully. I think I burned mine a little bit. I thought I’d be all clever and just label the sauce “burnt caramel sauce” like it’s all gourmet and such, but of course I am TELLING everyone, hey, I kind of burned it a little bit, so it might taste a little funny, and if you hate it, you can just throw it away, which totally defeats the purpose of putting the fake name on the label! But, there you go. – Keeps for about 3 months in the fridge and longer in the freezer. Bring to room temp before eating. Use a heavy-based 8-quart saucepan or Dutch oven. Try to avoid using a dark-colored pot, since you need to be able to see the color of the sauce. Into the saucepan add 1 cup of water, the 4 cups of sugar, and the corn syrup. Cook the mixture over high heat, stirring frequently with a wooden spoon. Make sure you have a small dish of water and a pastry brush nearby. You will use the wet pastry brush to wash down the sides of the pan when sugar crystals form. So, let the mixture come to a boil. It will go from a milky color to clear. Lower the heat to maintain a gentle boil. There should not be any splattering. Splattering liquid sugar is scary. Anyway, let the mixture gently boil, but DO NOT STIR. If you get antsy, you can always wash down the sugar crystals with the wet pastry brush, but just don’t stir the mixture. After about 20 minutes, the mixture will start to change color. You’ll probably notice some sections that are kind of honey colored. Swirl the pan a bit to even out the color if necessary. Now, after 20 minutes, keep a close eye on the sauce. It will turn a rich, reddish brown color, and when it does, you want to take it off the heat. The recipe says this will happen in an additional 8 minutes, but for me it only took a few extra minutes. So, take the pot off the heat, and slowly pour in the room-temp cream, all the while stirring with a wooden spoon. Don’t be alarmed by all the bubbling and the steam. It’s normal. Make sure the spoon reaches the bottom of the pan. You don’t want any clumps of caramel to form (if you get solidified glops and can’t stir them out, you can return the pan to the burner and set over medium-low heat. Stir gently until the caramel is smooth). * Espresso Caramel Sauce: in a small bowl, dissolve 3 tablespoons instant espresso powder with 2-3 teaspoons of hot water. Stir into the cooled caramel sauce. * Orange-Cardamom Caramel Sauce: in a small saucepan, combine 1 1/2 cups fresh orange juice with 2 tablespoons plus 2 teaspoons orange zest. Bring to a boil and reduce to about 1/2 cup. Pour through a sieve and press. Combine the strained sauce with 4 teaspoons ground cardamom then stir into the caramel sauce. Cleaning tip: Soak the pot and utensils in hot water. It will loosen any of the hardened sugar. Great recipe. I hope you are enjoying being cozy in your home for the holidays & not feeling housebound. 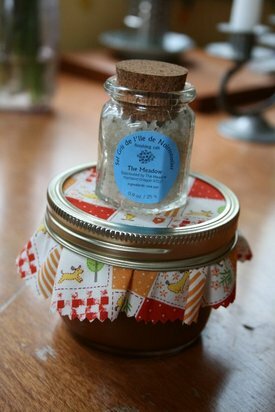 How did you prepare your jars? This sounds really good. Unfortunately, I managed to completely remove the nonstick lining on my only pot so right now I’m sans pot to make this! I’m actually planning on picking up a really cheap small pot on my way home just so I can do some stovetop cooking! Yep…It’s snowing yet again this morning in already buried Seattle…so even if I hadn’t already post-poned xmas…I’d be pretty stuck as well. Just give your gifts on January 6th, 12th Night/Dia de los tres Reyes and say you planned it that way :). So….I made a batch of world peace cookies after a few hours being in the fridge (um, the dough, not me), then I made a batch just today (48 hrs. later). Let me just say both batches were terrific, and the second batch was downright heavenly. WOW. Love them better than any other cookie. Thanks for posting that recipe! mmmm, so i am supposed to be in pdx friday. where exactly do you live because i love burnt stuff. merry season to you. just started reading and really loving it. That really looks delicious. I’d like to invite you to take some time to drop by at Foodista and share this delicious recipe with us. We have launched an online food and cooking encyclopedia ala wikipedia. Add a recipe and you can win a $100 gift card to Sur la table. Don’t forget to register first so we know who to thank the recipe for. Thanks! See you there! Burnt Caramel Sauce… very gourmetish. 🙂 Burnt sauce is better than NO sauce so I’m still jealous. Happy Late Christmas! sweet….. i love caramel sauce! Mmmm. caramel sauce sounds so good right now. over poached pears. with a little bit of ground nutmeg. been sick for the past week and now i’m dreaming of food i can’t possibly taste or eat. sigh.